Iowa’s 4,000 professional local firefighters and police officers should contribute 40 percent of their pension fund costs — a move that would have increased their obligation to the retirement pool 17 to 29 percent in recent years, Gov. Terry Branstad said in an interview with IowaWatch. Local government would pick up the other 60 percent that goes into the pension fund, Branstad said. Splitting the costs along those lines would save local governments millions of dollars and put the public safety employees’ retirement packages in line with retirement programs other public employees have, he said in the interview, conducted earlier this month. Employees pay into the system but at a fixed rate of 9.4 percent of their wages. That amounted to 31 percent of the pension fund’s total costs in fiscal 2011, the last year for which data are available. The share was 34 percent in fiscal 2010. Local cities must cover the rest under Iowa law, regardless of how much is needed, to make the system strong enough financially to cover pensions paid to 4,000 fire and police officers in Iowa who have retired. Often that arrangement has increased the government share, although not always. “When the fund is not adequate, the increase is put 100 percent on the municipality. And that’s something that I think needs to be addressed,” Branstad said. But Branstad said he is siding with local government on this matter. Any change would have to be addressed in state law, which establishes the rate that firefighters and police pay into the system and what cities pay. That law prohibits cities from paying less than 17 percent of the employees’ salary. But cities are paying 26.12 percent of an employee’s paycheck this year, said Terry Slattery, executive director of the Municipal Fire and Police Retirement System of Iowa, which administers the pension program. The Municipal Fire and Police Retirement System’s board of directors sets the cities’ rates annually, based on actuarial analyses of the pension program’s pay-out obligations. Cities covered 67 percent of the pension fund’s fiscal 2011 total costs, which included pay-outs and administration. That was up from 62 percent the previous year, the fund’s budget figures show. A small portion was covered by state appropriations until this fiscal year, which started July 1. The Legislature phased out the state’s portion of the fund. 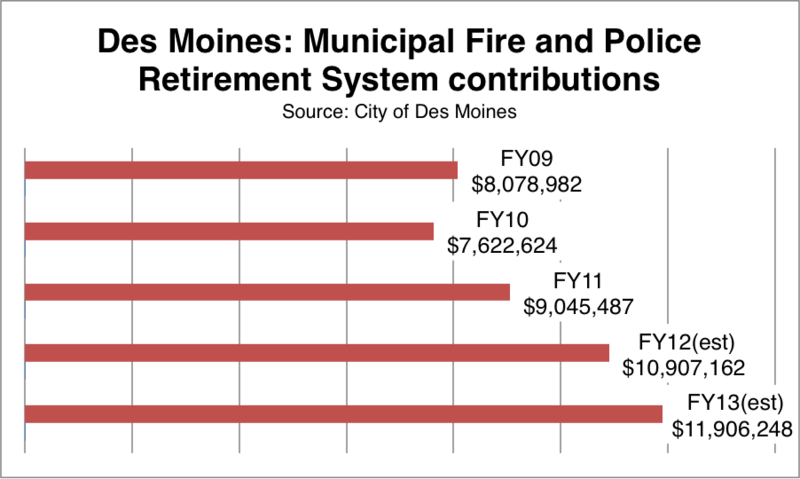 Des Moines’ contribution to police and fire pensions is expected to increase 47 percent from fiscal 2009 to fiscal 2013 if the city pays the $11.9 million it anticipates owing this year, financial officials there said. The city would owe an estimated $9.7 million this year if it were required to pay only 60 percent of the pension fund’s anticipated costs, the city’s finance director, Scott Sanders, said. That would leave the city’s 280 firefighters and 455 police who pay into the pension pool owing the remaining $2.2 million, or an average of almost $3,000 per employee. Sanders is a member of the Municipal Fire and Police Retirement System of Iowa’s board of directors. He said curbing the costs cities pay for public employee pensions is high on the list of things to do for finance directors in Iowa’s largest cities. 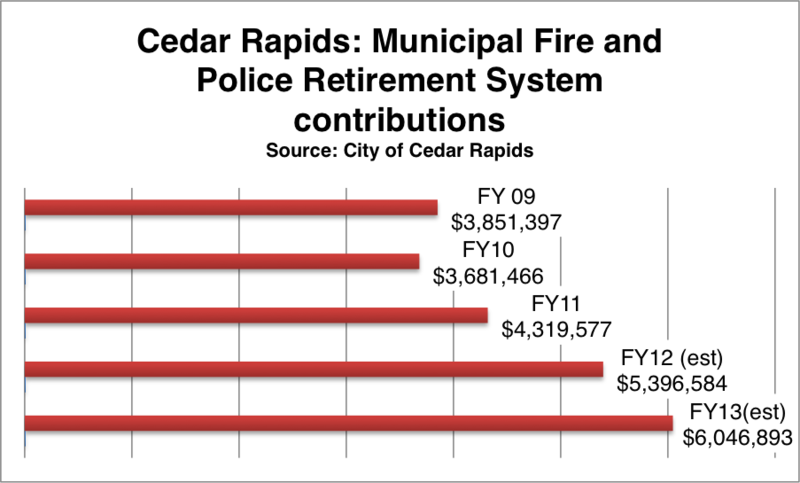 Cedar Rapids budget officials anticipate the city paying the Municipal Fire and Police Retirement System of Iowa $6 million this fiscal year, up 57 percent from what was paid five years earlier in fiscal 2009. The Iowa League of Cities is pushing for the 60/40 split in fire and police retirement contributions. Scofield, with the firefighters’ association, said cities are getting a good deal with the current system because they do not have to pay unemployment insurance – the system handles that – and they save on Social Security taxes that are not required for firefighters. He said cities often have been paying at or near the 17 percent floor. He said his membership will watch for any moves on its pension funding when the Iowa Legislature meets next year and will be talking with legislators. Ankeny Fire Chief Rex Mundt, president of the Iowa Association of Professional Fire Chiefs, was more cautious about commenting on a 60/40 split, given that a specific proposal is not on the table. However, “We believe in a fair and open conversation on all of the issues because it is a sensitive issue,” Mundt said. Forty-nine Iowa cities contribute to the Municipal Fire and Police Retirement System of Iowa. That system was established by the Iowa Legislature in 1990 and launched at the start of 1992 to consolidate 87 local retirement systems that the cities had administered on their own. Slattery said he’s had no discussions with the governor’s office about any changes in how the retirement pool is funded. 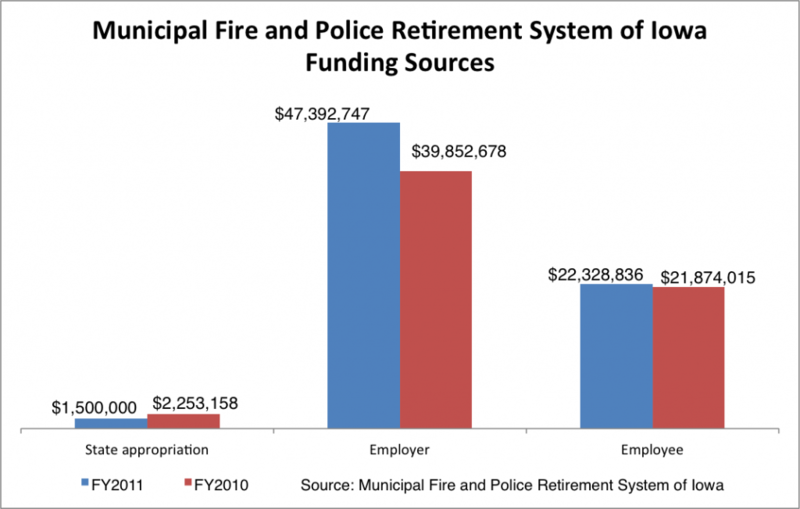 The Municipal Fire and Police Retirement System of Iowa had $1.8 billion in total assets at the end of fiscal 2011. The fiscal 2011 report shows it collected $47.4 million in employee contributions, up 19 percent from almost $39.9 million in fiscal 2010. Firefighters and police officers paid $22.3 million into the system in fiscal 2011, up 2 percent from almost $21.9 million in fiscal 2010. Slattery said a full report for fiscal 2012, which ended June 30, is being audited and will not become final until the end of the calendar year. Pension programs were not the only public employee matter Branstad talked about during the IowaWatch interview. He said a proposal he made this summer that public employees consider voluntarily paying 20 percent of their own health insurance premiums also could save the state money and be fair when compared to what employees pay in the private sector. AFSCME Council 61 has filed a prohibited practice complaint with the Iowa Public Employment Relations Board over Branstad’s proposal, saying health insurance payments cannot be changed without collective bargaining. “If everybody paid 20 percent we’d save over $100 million, so that’s really significant,” Branstad said. Branstad said that while he doesn’t expect many workers to go along with the plan right away, he and Lt. Gov. Kim Reynolds, who have volunteered to pay 20 percent of their health insurance premiums, are trying to let their actions speak for themselves and hoping public employee bargaining units accept the deal during the next round of contract negotiations. Branstad also said he would like IPERS to be reformed so that its funding is stronger. He supports a move that was effective this month, shifting IPERS retirement payments from being the average of an employee’s highest three years of pay to being the average of their highest five annual salaries. He hasn’t even finished the second year of this term as governor but the political field is full of people wondering about getting re-elected. 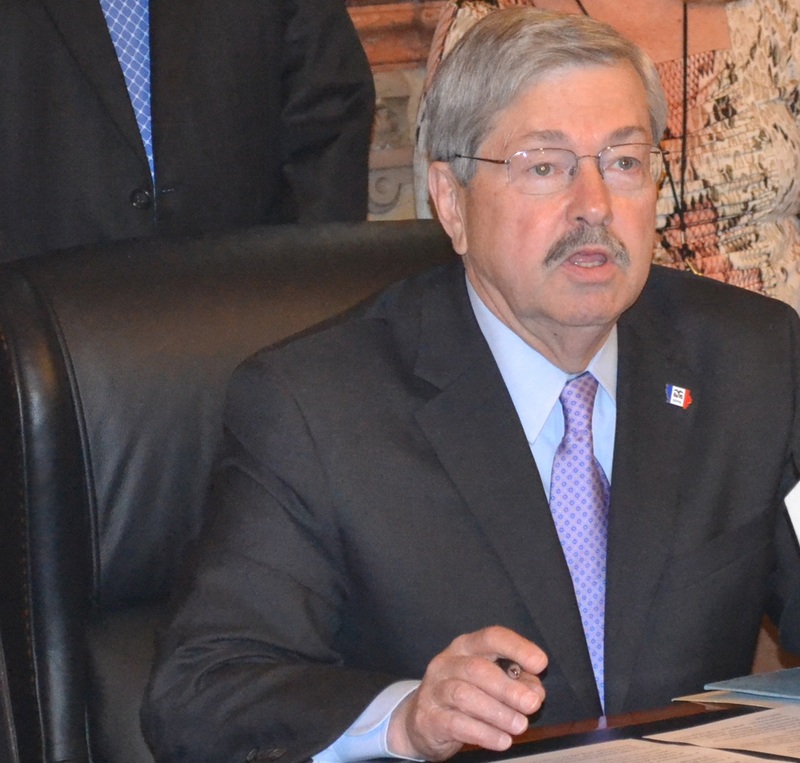 And while he said it’s too early to know about another term as governor, Terry Branstad had two things to say about whether he or not he’d want to seek a sixth term. One, that he doesn’t expect to decide until 2014, the next election year. And, two, if he doesn’t run, he thinks Lt. Gov. Kim Reynolds could do the job. Iowa never has elected a female governor. “I feel that she’s been a great partner and is more than prepared to handle this job if I decide not to,” Branstad said. Branstad said he’s had fun with the job after leaving the Des Moines University presidency to challenge fellow Republicans Rod Roberts and Bob Vander Plaats in the 2010 Republican primary and then incumbent Democratic Gov. Chet Culver in the general election.